We’ve got some very healthy heritage snow and shelling peas, Pisum sativum var. sativum, most of which came from Seedsavers. I get such a happy feeling observing our growing peas. The seeds feel lovely to the touch, they unfurl and push through the soil so eagerly as they germinate, their leaves are very soft and often delicately patterned. But most of all they remind me of my childhood, when my family used to go on weekend drives to country farms in Kent. In the 1960’s farms near urban centres used to advertise in local newspapers when they would be opening to allow people to ‘pick their own’. Harvest time open days. We had two favourite farms. One grew raspberries and the other peas. My sister, Cathryn, and I used to eat them as we picked. This practice was tolerated and we put the pea shells or raspberry tops in a separate bucket so the farmer could estimate what to charge us when we left. It was a lovely way to have a weekend break and many neighbouring families would bring picnics and eat them near the farm buildings where the paid pickers had their temporary accommodation. Classic family entertainment. Anyway, back to Bellis. During the period when we were rejuvenating the soil I grew closely-related, smooth-seeded Field (aka Dun) peas, P. sativum var. arvense, as part of a green manure. Apart from adding organic matter they added a little nitrogen to our soil: nitrogen-fixing bacteria live in association with their roots. 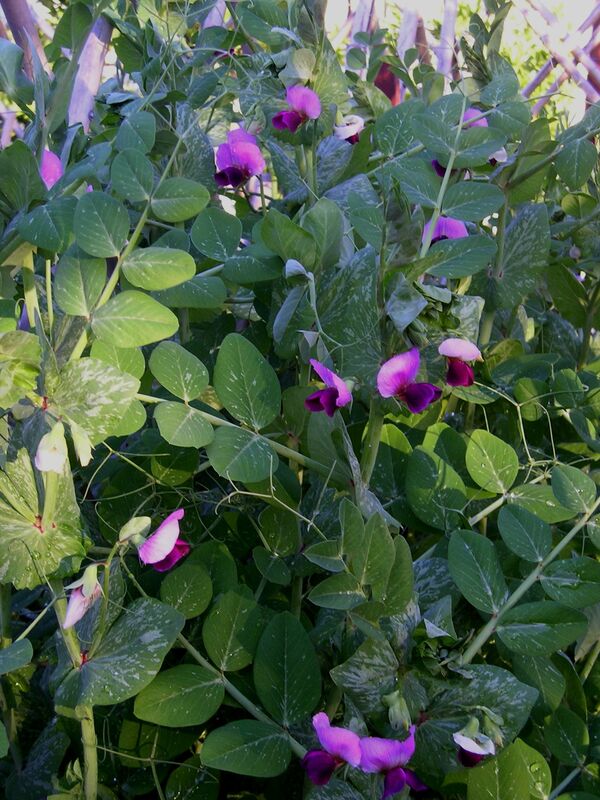 So when you dig these pink-flowered peas in, they decompose, releasing nitrogen. In Asia peas are cultivated so their tender shoot tips can be cut for cookery and sprouted peas are popular in western salads, sandwiches and for garnishing. Sprouting is fine, but I feel bad nipping pea shoots unless it’s to improve their form. This year we’re growing snow peas ‘Delta Matilda’; ‘Oregon Sugar Pod’ (from our own saved seed); ‘Skinless Dwarf’; and shelling peas ‘Greenfeast’; ‘Telephone’; ‘Spanish Skyscraper’; and ‘Dutch Purple Podded’. Fibrous-podded ‘shelling peas’ were developed relatively recently in the 19th century, other peas having been grown in the northern hemisphere since the bronze age. 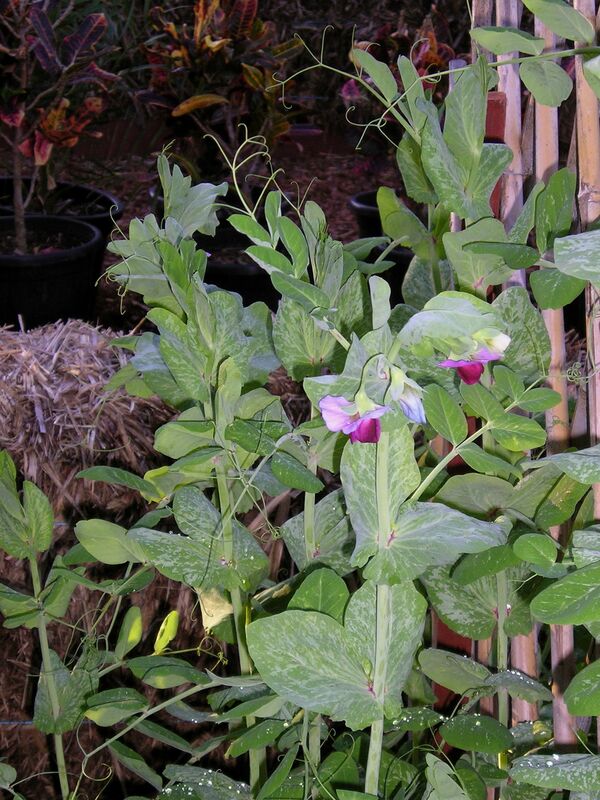 Pea flowers self-pollinate before fully opening, which means saved seed is highly likely to resemble its parents. Saving pea seed is great for beginners. Serious seedsavers would plant cultivars being grown for seed away from other peas to reduce the risk of accidental cross pollination. Seed is routinely saved from the best, most vigorous plants. 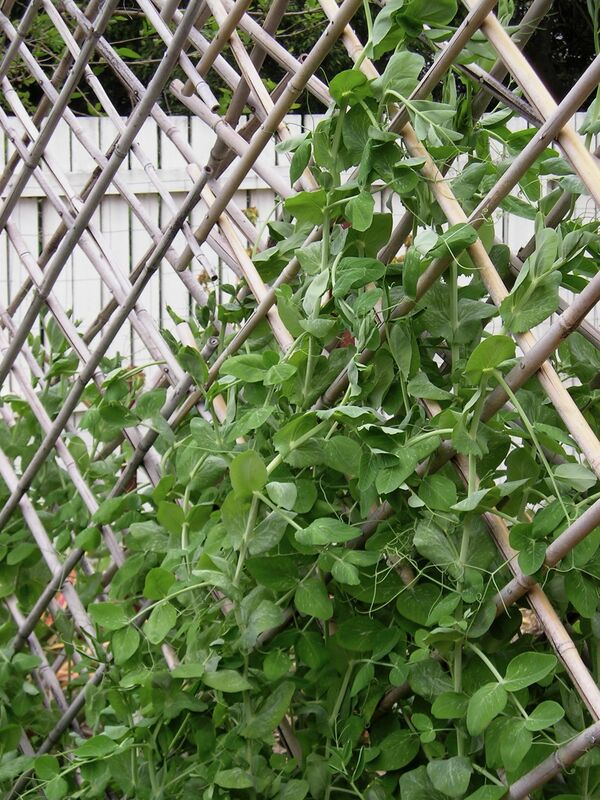 With peas it helps to select plants with large leaves and long pods. Pods with the largest, most numerous seeds are best of all. Mature, ripened seed rattles in the pods and must be harvested dry, then fully dried indoors. Seed stored in a cool, dry, dark place stores well for three years, up to eight years in optimum conditions. crops well. In a warm, moist winter they grow to 1.75m high. From mid-August, as temperatures and humidity rise, ‘Oregon Sugar Pod’ is less susceptible to powdery mildew which seems to affect modern cultivars grown in this area. White flowers. ‘Dutch Purple Podded’, (pictured top, left is one of the oldest cultivars. It’s a good cropper. It’s taller, growing just over 2m, with beautifully greyish foliage, pink flowers, bold purple pods and wrinkled brown seed. Highly ornamental. ‘Greenfeast’. The first sowing failed. The second batch are growing strongly, but are not yet ready to flower. Grows to 1.5m and produces rounded, green seed. ‘Delta Matilda’ (right) has semi-pendant, large pink flowers. Robust, tall growth to 2.5m. Large pods, brown seed and pretty patterned foliage. ‘Spanish Skyscraper’, ( left) with white flowers and wrinkled seed, is similar to ‘Telephone’. I first grew this Seedsaver cultivar last year and the pods seem slightly smaller than other cultivars I’ve grown. Grows to 2.25m. ‘Dwarf Skinless’ (right) has dwarf pink flowers, patterned foliage and small, dark brown rounded seed. It’s a robust cultivar that flowers profusely at 1m high, is extremely pretty and deserves a place in an ornamental or cottage garden. Worth growing again just for its beauty and form – let’s hope it tastes as good as it looks. Any snow pea pods that are left to mature can be eaten as shelled peas, likewise shelling peas harvested early can be eaten whole as snow peas. Is there a difference? Just that snow peas, picked young, have less fibre and are slower to develop the tough parchment-like lining in their pods. 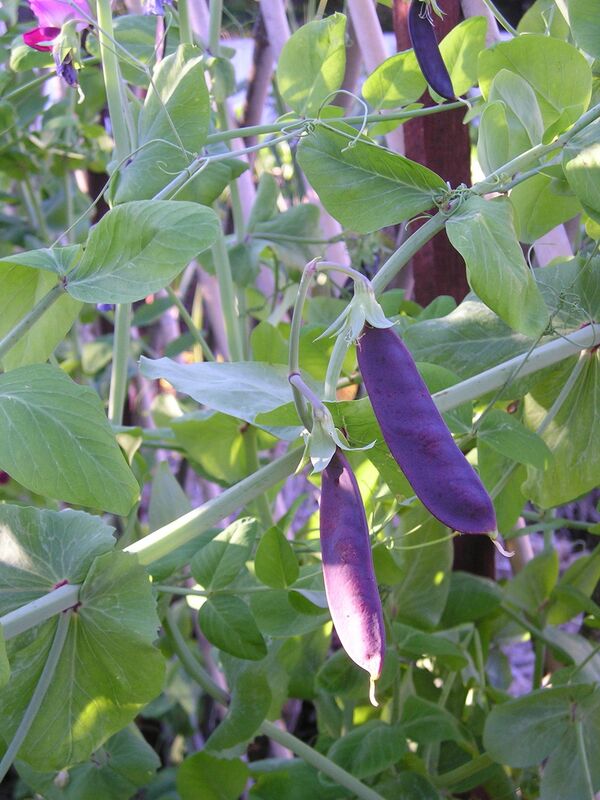 Both types can be harvested to provide the super sweet immature peas – petit pois – so beloved in France. The seeds were sown on 26th May. I first soaked the seeds in water overnight, so they would be fully imbibed, then sown in well dug, pH neutral, compost-enriched soil in a position that gets full sunshine from dawn until late afternoon. After sowing I sprinkled a light surface mulch of nourishing, well-rotted cow manure. The bed is enclosed by bales of sugarcane which keep it protected from desiccating winter winds. I use bamboo frames for supporting climbing vegetables because they’re cheap, easy to install and easy to store when not in use. 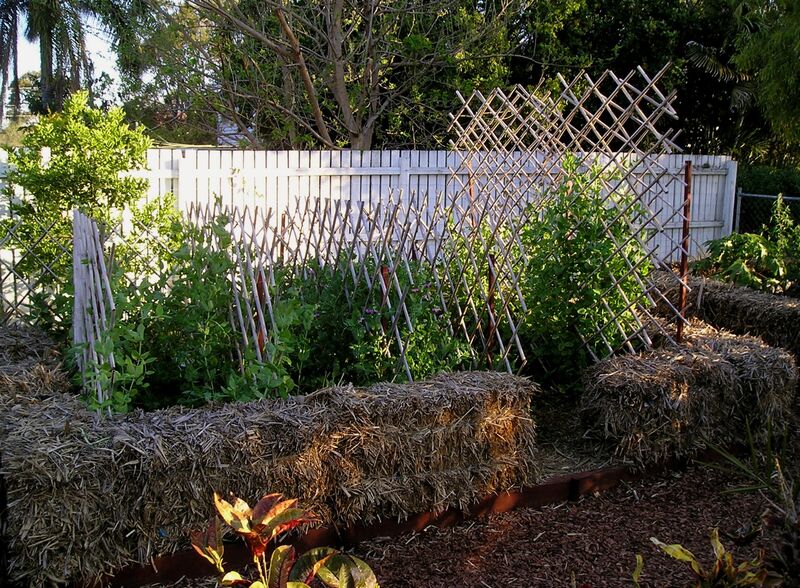 Bamboo isn’t ideal for their tendrils to grip, as peas prefer a rougher surface and smaller diameter twigs to twine around. In London I used to use coppiced hazel, which was perfect. Peas dislike extremes. 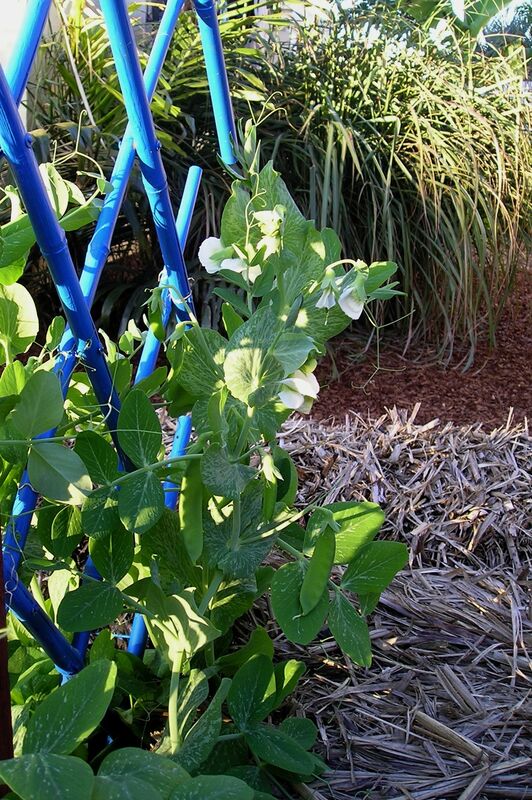 My peas get a light watering each day – we haven’t had rain for eight weeks – just enough to prevent wilting, but not too much to encourage root rot fungi. I water mid-morning to midday so wetted foliage dries out before sunset. I foliar feed them once every three weeks with seaweed. Watering and feeding this way, which avoids adding too much nitrogen, greatly reduces the risk of aphids and powdery mildew. This fungus is particularly damaging and can ruin entire plants. By growing your own peas from your own saved seed you can help them adapt to your local soil and growing conditions – a simple technique allowing crops to adapt to Climate Change.